The windows in your car help you to see the road clearly and should be taken care of when they are damaged. The smallest crack may seem unimportant until a bump in the road or extreme weather conditions worsen the problem. PG Arleta auto glass repair specialists can restore any damage to your automobile windows. These technicians have the training and experience that local drivers depend on. Auto accidents can happen on any road and at any time. Your windshield is designed to take maximum force, but can quickly reach the breaking point during impact. PG auto glass repair in Arleta provides rapid response using mobile service vehicles to restore damage to your windshield, side or rear windows. Roadway debris is more dangerous to your vehicle than you may realize. This debris comes from commercial vehicles and scattered sticks and rocks due to storms or high winds. A single projectile of debris can break or crack any window on your car or truck. PG Arleta auto glass repair gives drivers a lifetime guarantee on every repair to showcase the highest level of service. Regardless of the technical skill of a specialist, some damages cannot be restored and will require a total glass replacement. The quality of the replacement glass is important and there are some brands that are not rated safe for long-term use. PG auto glass repair in Arleta uses the highest rated OE glass for every replacement to provide you with the safety you deserve. PG Arleta auto glass replacement experts offer emergency service when you are dealing with the after effects of vandalism. Having a trusted company to stand by your side and that knows what to do eases the stress of the situation. 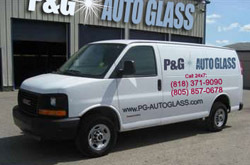 PG auto glass replacement in Arleta provides 24/7 services. Do you live in Arleta, CA in zip codes 91331 and 91334? Contact PG Auto Glass for all the auto glass repairs and replacements you need.